Given the litigious society we live in here in the United States, I feel I must post a disclaimer to the instructions posted here on converting from 7 Hp to 8 Hp on the Model 57 John Deere mower. This is not an easy project and requires someone with the proper skills and tools to make this conversion. I also make no promises to the success of this conversion. I have only stated what has worked in my situation, but it may not work in your situation. Safety is number one, so pay attention and follow the safety recommendations in both the owners manual for the lawn mower and the Tecumseh engine. John Deere and Tecumseh both use their respective registered trademarks. I have attempted to denote any trademarks in these instructions and apologize if I missed any unintentionally. I freely share the information on this web page in the hopes is saves other people time and effort in saving their vintage Model 57 mowers. 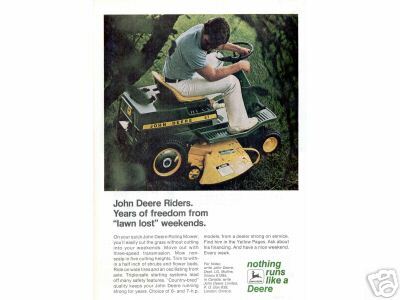 John Deere introduced their first step-though, rear engine riding mowers in 1970 with the model 55 and 56. The model 57 was released the following year. 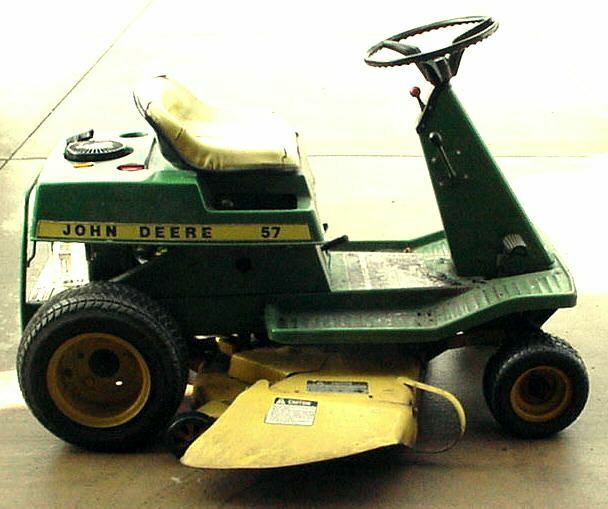 The production life of the model 55 concluded after 1972 while the model 56 and 57 mowers were available through 1974. Serial numbers and years are listed below. 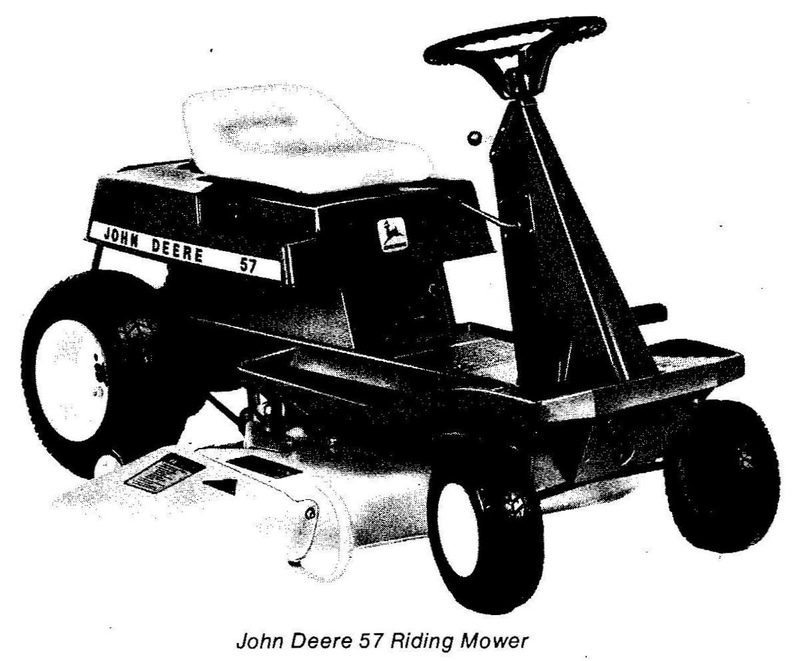 (These riding mowers were replaced by models 65, 66 and 68 in 1975.) Each model was driven by belt from the engine to a two or three speed transmission, then by chain to the rear axle differential. Mower height of cut was adjustable in steps between 1 and 3 inches by a single lever, and a small hitch plate was mounted at the rear of the frame. Model 55 features: Handlebar steering, Tecumseh 5 hp V50 vertical engine with recoil starter, 2 forward - 1 reverse transmission, solid front tires, pneumatic rear tires, single blade mower deck with 26 inch cut, net weight 266 pounds. A mulching kit was optional. Model 56 features: Wheel steering, Tecumseh 6 hp V60 vertical engine with recoil starter, 2 forward - 1 reverse transmission up to serial #44000, 3 forward - 1 reverse transmission starting at serial #44001, pneumatic tires, single blade 28 inch mower deck, net weight 269 pounds. Electric starting and mulching kits were optional. Note: Many of these tractors have replacement 7 hp V70 engines. Model 57 features: Wheel steering, Tecumseh 7 hp V70 vertical engine with recoil starter, 2 forward - 1 reverse transmission up to serial #13999, 3 forward - 1 reverse transmission starting at serial #14000, pneumatic tires, dual blade 34 inch mower deck, net weight 326 pounds. Electric starting and mulching kits were optional. 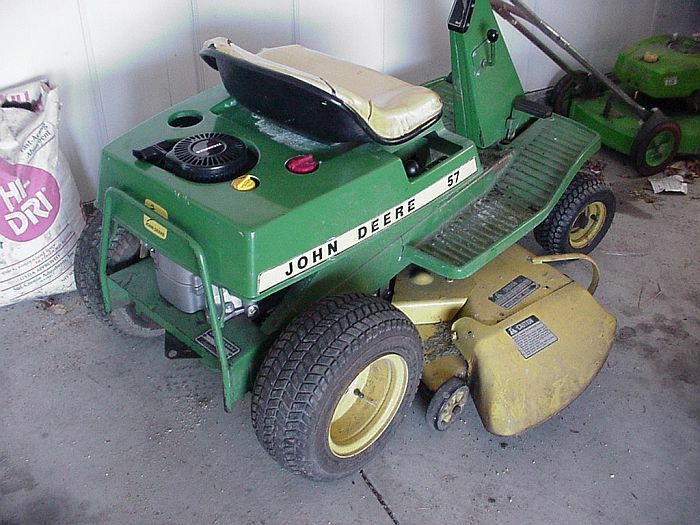 I purchased my John Deere 57 used in April 1984 from the local John Deere dealer. It is serial number 37728 and I purchased it for $397.50. The date 1974 is handwritten under the seat cover. I installed a short block engine in 1988. I installed a new engine in 1996. 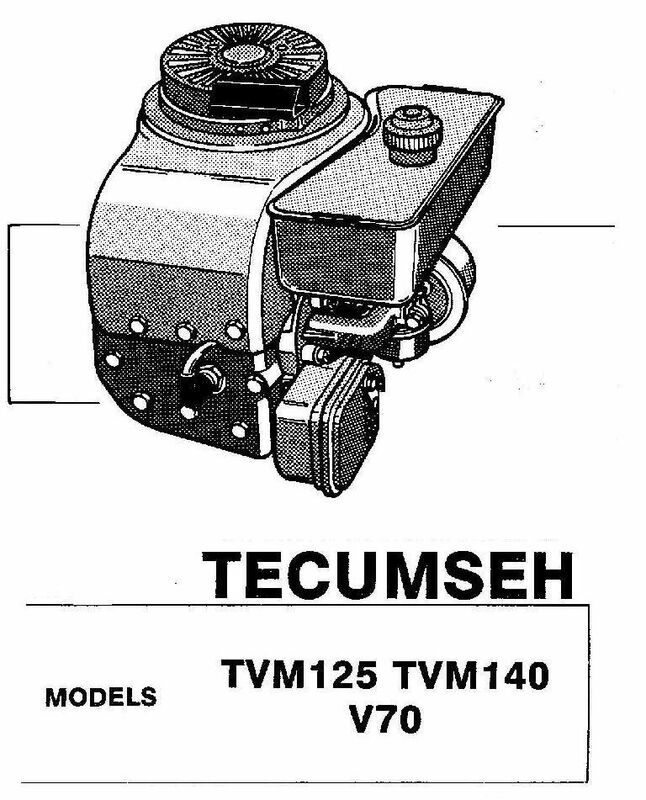 The 1996 engine was a Tecumseh TVM125-TVM140-V70. In the Summer of 2004, the engine developed a cracked block. I experienced about 8 years of life per engine. Although I only got 8 years of life per engine, I have really enjoyed my Model 57. It has mowed grass in Illinois, South Carolina, and Georgia. My houses have had small to medium size yards which fits the Model 57 fine. I wanted to keep my 30 year old classic Model 57 running versus spending several thousand on a new mower. I called my local Tecumseh dealer.....he checked.....and said the 7 Hp model was no longer available due to a change in U.S. emissions laws. I also checked with several companies on the internet, and they gave me the same answer. I was about to throw in the towel and send my Model 57 to the junk yard.....when my neighbor told me he had the exact same Model 57 and was able to package an 8 Hp Tecumseh into the Model 57. He used to work at a John Deere dealership, and he bought his new in 1973. He agreed with my analysis this was one of the best small riding mowers ever built. He purchased his 8 Hp Tecumseh from Northern Tool. It was an 8 HP, Model# TVM220-157291K. I ordered the same new engine in Fall 2004....it was back ordered and did not arrive until Thanksgiving 2004.
from 7 Hp 7/8" Shaft to 8 HP 1"
The most difficult aspect of converting from the 7 Hp to 8 Hp Tecumseh is converting the 2 pulley drives. The original top pulley is a 2.5 inch OD with a 7/8" ID. A new pulley can be purchased from lawn mower repair shops or machine shops. My neighbor chose to purchase a slightly larger 3 inch OD with 1 inch ID from the local lawn mower dealer/repair shop because they did not stock 2.5 inch OD with 1 in ID and this will increase the driving speed of the mower by 20%. My neighbor says the increased speed is nice compared to the original speed. I chose to purchase the same 3 inch OD and 1 inch ID new pulley as my neighbor. The tough pulley to convert is the bottom pulley that drives the blades. John Deere designed a custom pulley for this job that has a long shaft/tube to connect the pulley to the motor shaft. One can bore out the old pulley by drilling the original 7/8 inch bore to 1 inch using a 1 inch bit. This leaves just enough material to support the washer on the bolt that attaches the pulley to the engine shaft. The washer for this bolt must be exactly the same size as the OD of the tube. The trick is how do you drive the pulley since drilling the bore out to 1 inch removes the 1/4 inch drive key? I ordered the items noted above from McMaster-Carr, and they were delivered in a couple of days. The only machining I had to do was cut the 1 inch keyed shaft to the correct length, then drill through the center of the shaft. 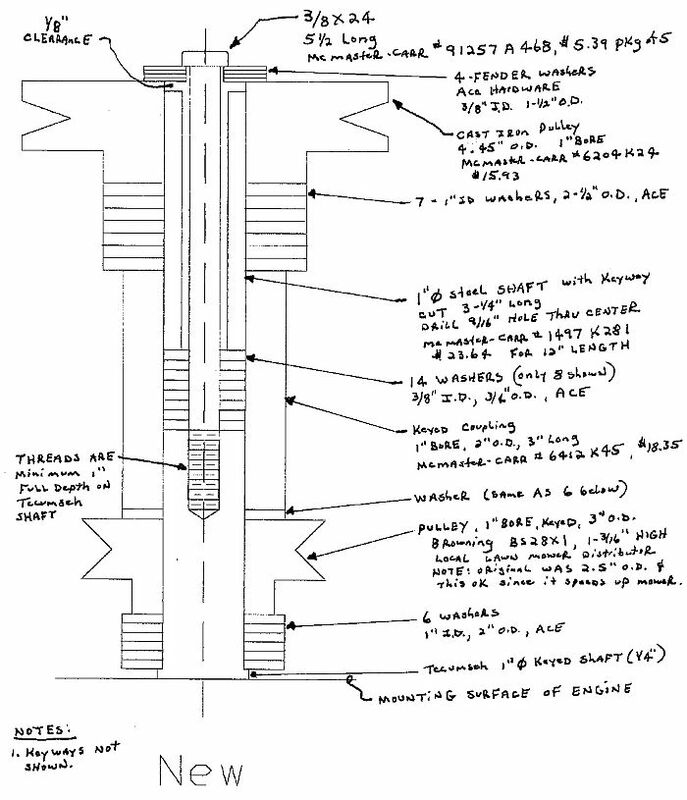 The drawing above shows drilling a 9/16 inch hole through the shaft. This is an error and a 1/2 inch diameter hole is sufficient. I used my 3 jaw wood chuck to hold the 1 inch bar in my drill press. I drilled from both ends. All parts came from either the local lawn mower shop (3 inch OD upper pulley, McMaster-Carr, or the local Ace hardware store). I assembled the pulleys onto the new motor with the new motor setting upside down on sawhorses so I could verify key pulley height dimensions were achieved. The original 7 Hp Tecumseh was designed for the throttle cable to approach the engine from the front of the engine. The new 8 Hp Techumseh is designed for the throttle cable to approach the engine from the back of the engine. I believe my neighbor figured out a linkage which gives the same direction of throttle as the original. I fabricated a new arm which fits the throttle cable fine, but the direction of throttle is still backwards. Maybe next summer I will copy my neighbor's design, but for now I will live with the inconvenience of the throttle being backwards. A rough concept sketch is shown below of my design. I purchased a 12 inch long piece of brass from Ace Hardware that was 3/4 inch wide and 1/16 inch thick. I used 4 inches of this piece for the arm and the remaining 8 inch piece for the bent brass bracket shown. The arm pivots on a new bolt installed in the existing square hole in the engine bracket. The bent brass bracket also bolts to an existing engine bolt. The pivot arm detail sketch looks complicated, but it is really just a 1/4 inch ID bronze bushing from Ace used to pivot the arm on....plus associated washers. I drilled a hole in the bolt and installed a cotter pin in case the nut vibrates loose in operation. Remove the sheet metal muffler heat guard on the left hand side under the seat. It is no longer needed because 8 Hp has different muffler design and it will hit the new engine. Three of the 4 motor mounting holes are the same. The rear left hand (from driver's perspective) hole must be re-drilled. Prior to installing the 4 mounting bolts, slip the top pulley and spacers up onto the motor shaft. There is not enough clearance to install the pulley after it is bolted in. Also attach the upper v-belt to the upper pulley. Now bolt the engine down with the 4 mounting bolts. Also re-attach the grounding wire from the on-off switch to the new motor. My connector was the same, so I had to do was plug it in to the new motor on the right hand front of the motor. The lower pulley and associated parts can now be installed. I assembled all the lower parts as a sub-assembly, then lifted this sub-assembly up, engaging the 1/4 inch key, up into the final position. Tighten the 3/8 inch diameter bolt which holds the entire assembly together. Attach the lower v-belt to the lower pulley. Now spread the upper 2 bars of the hitch plate to fit around the new 3.0 inch OD upper pulley versus the original 2.5 inch OD pulley. I held the hitch plate in the vise and bent the bars with a pipe wrench. Attach the hitch plate and adjust it so the lower belt won't slip off, but not so close the hitch rubs on the lower pulley. Tighten the 2 bolts that hold the hitch plate to the frame. Remove bolts and rotate pull rope cover so rope is pointing to left of mower. Tighten bolts after rotating. The 8 Hp motor is taller than the 7 Hp original motor. Remove the seat and top cover by removing the 4 bolts under the seat. On my installation, the hinged steel seat mounting plate contacted the gas tank. I used a Dremel grinder to grind enough relief in the hinged steel piece so it would not rub a hole in the new gas tank over time. Saw 2 square spacers from 3/4 inch thick plywood. This raises the seat 1.5 inches. Drill 4 holes in these spacers to match the seat bolt pattern. Also cut clearance in the upper spacer for the hemisphere shape on the seat that protrudes downwards. I cut my clearance with a hole saw, but a saber saw could be used as well. Replace the original 3/4 inch long seat bolts with 2.5 inch long bolts due to the 1.5 inch raise in seat height. Start all 4 bolts but do not tighten. It is a bear to get the 1st bolt started because the seat, cover, and hinged piece are all trying to move! 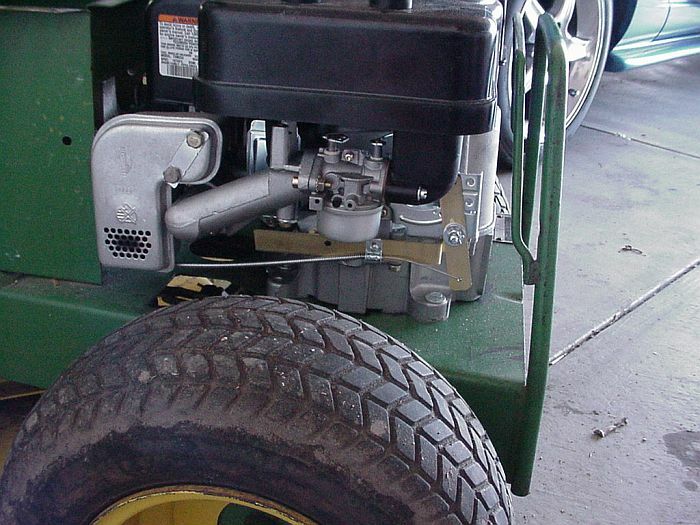 Pull the rear cover back until the back lip drops between the 2 bars on the back of the mower. Then adjust the seat forwards and backwards until it is where you want it. Raise cover just enough to tighten 2 bolts in back so whole assembly does not move out of place as you tighten the bolts. Tighten balance of bolts. Verify top cover still drops down between 2 bars on rear. Mark top of fuel cap and oil cap with powdered chalk. Lower top cover onto engine and press down over each cap so chalk marks top cover. Drill 2 new holes for fuel cap and oil cap using hole saw or saber saw. I used Dremel tool with grinding wheel to grind clearance for back bolt of pull rope assembly. I did not cut out new holes for 2 plastic nuts that hold down air cleaner cover. There was just enough clearance to get the gearshift knob into reverse gear. May have to Dremel out some clearance here pending upcoming field tests. Verify top cover closes ok and there are no major interferences. The existing throttle cable is 1 - 2 inches too short. I purchased a new cable at Ace hardware that had a 54 inch conduit and 57 inch inner wire. The new cable came with 1 straight end and 1 end bent. I bent the straight end since this required. To remove the throttle cable, the steering wheel must be removed. The steering wheel is attached to the steering shaft with a 1/4 inch solid dowel pin. The dowel pin is at the bottom of the steering wheel. After 30 years, my dowel pin did not want to come out !! I had to drill out the pin then drive remainder out with a punch. Once the dowel pin was out, I removed the wheel cover center piece with Deere logo on it...and filled pocket with penetrating oil. I then tool punch and went in through dowel hole to drive wheel upwards. I rotated from one dowel hole to the other until finally the wheel started to come up from the shaft. Remove the 3 little bolts that hold the throttle linkage. Before pulling out the old cable from the mower, go to the engine end of the old cable and tie a string onto the old cable. This string will make it easier to thread the new cable through the mower. Gently pull the old cable and string from through the mower. Untie the cable and remove the old cable from the shifter assembly. Install new cable in the shifter assembly. Be careful not to break the 2 ears that bend and retain the cable. Attach engine end of new cable to string and use black electricians tape to make smooth transition from string to cable. Gently pull string and new cable through mower. Remove black tape and string. Attach throttle cover with 3 bolts. Clean steering shaft with emery cloth and then lubricate so wheel slides smoothly over shaft. 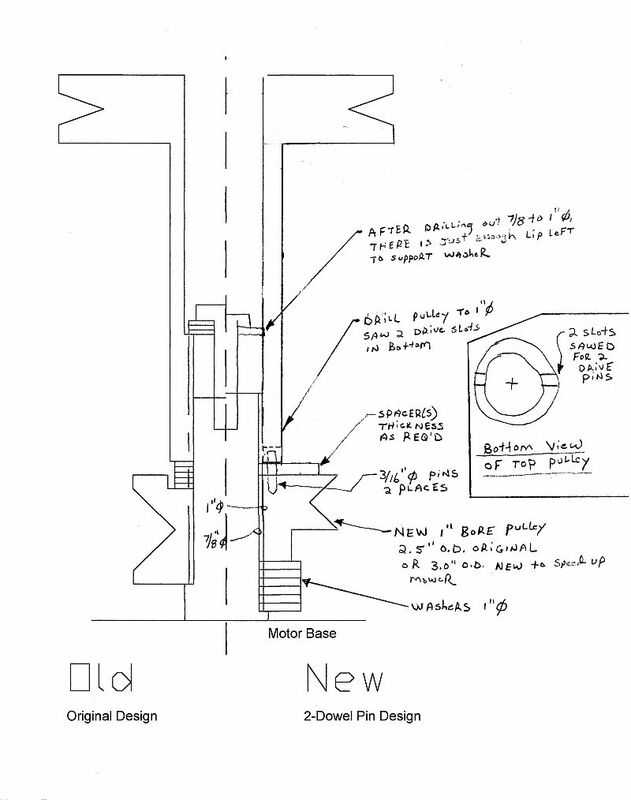 Use jack to keep shaft in up position (I placed hydraulic floor jack under bottom of shaft to force assembly up). Drop steering wheel over shaft keeping hole alignment for the pin. I used a hollow shear pin versus the original 1/4 inch diameter solid dowel pin. Reinstall center plastic cover in wheel. Removing the rusted steering wheel was the toughest part of this job for me !! Attach throttle cable to engine and tighten clamp to hold exterior of cable in place. Fill the engine with motor oil and gasoline. Make sure you connected the grounding wire from the key to the new engine so you have a way to easily shut off the engine !! My throttle linkage is in reverse. Instead of choke at the top of the throttle knob and idle at the bottom, this is reversed for the new engine. I believe my neighbor developed a linkage which corrects the throttle direction back to normal and I may copy his design this coming Summer....but for now I will live with this inconvenience.....see next paragraph..
Update on Throttle Linkage.......After the initial conversion was completed, I was able to design a new throttle linkage which gives the same direction on the throttle level as the original design did. The trick is that when the throttle cable moves backwards toward the rear of the motor, the carburetor linkage has to almost move backwards. 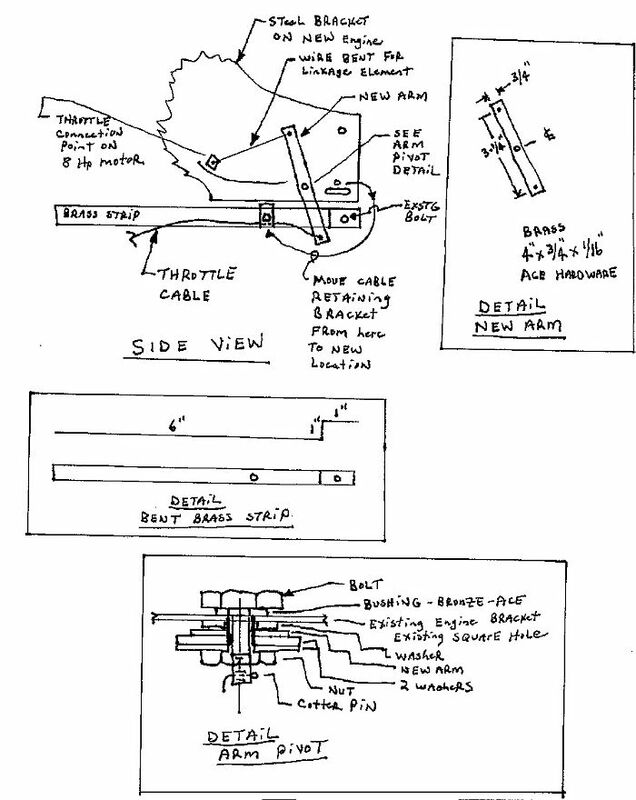 Using just one arm results in the carburetor linkage moving the opposite direction of the throttle linkage. I developed a design with 2 arms that results in the carburetor and throttle linkage moving in the desired same direction. The 2 arms are connected using a pin in one arm and a corresponding groove for the pin to slide in on the other arm. Click on this link to see a concept design of the 2 arm design. When I get a chance, I will take a digital photo of this 2 arm design and add it to the computer file section below. With the transmission in neutral, start the new engine. I had to spray a little ether starting fluid in the air cleaner to get the motor going the first time. Inspect for abnormalities, and if ok test drive the mower including activating and deactivating the blade. Since it was late December when I fired up my unit, I could only drive it around my garage. 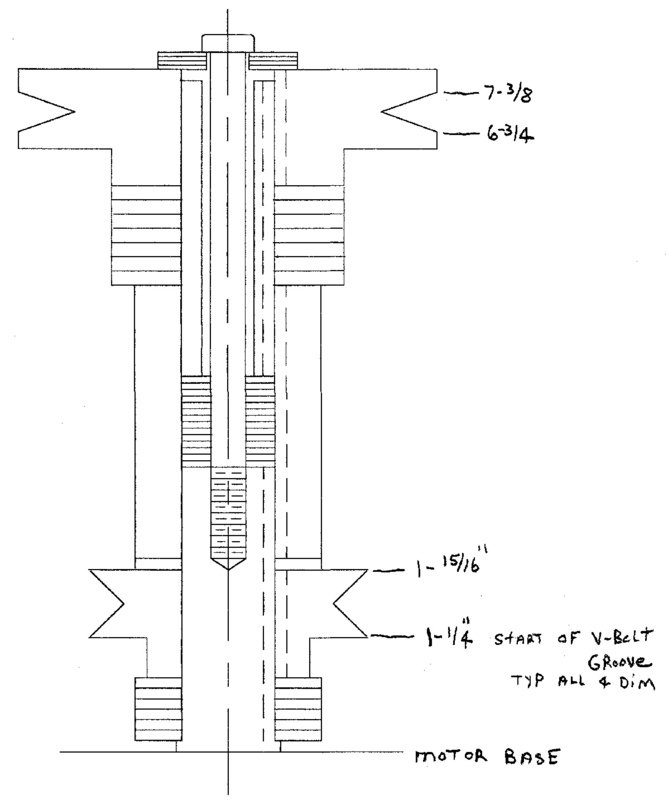 My initial reaction is I like the 20% speed improvement from using the 3 versus 2.5 inch OD upper pulley. The real field test comes this next May !! Update on Field Testing (April 2005)....I had to use a shot of ether to get the new engine to start. I started it and ran it briefly in Dec 2004, so it had set 3 months until April. I need to do some fine tuning of my throttle linkage because the linkage may not be moving the carburator to the choke position...my neighbor who also did this conversion had the same issue and said unless the linkage is completely moved to the one end it will not start. Once started with ether, the mower ran fine for the 1 hour it takes to mow my lawn. On the 2nd mowing, my drive chain fell off and I had to readjust the chain tensioner..which I had never adjusted in ~25 years. It would be a good idea to adjust the chain tensioner while doing the conversion...I would have done so but didn't realize it was time to adjust it. So.....so far so good on the conversion results. Will tweak the throttle linkage when it is warm enough outside to work on it. 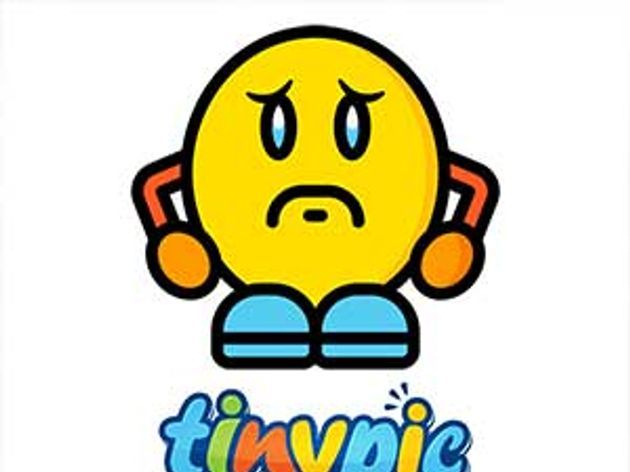 5/1/2005. Update (June 2008)....My trusty Model 57 entered its 34th mowing season this year. The new motor is still running fine. When I start the mower, I have to move the throttle linkage to its max choke position by hand...so it starts easier. This motor is really sensitive to having the throttle linkage to its max position..I only move it about 1/4" inch and this makes the difference between hard and easy starting. I did splurge in 2007 and put new front tires on the mower. I seriously think the front two tires were original from 1974. 6/24/2008. Update (May 2009)....My trusty Model 57 entered its 35th mowing season with no troubles at all. Feels like a new mower with the 2 new front tires! Hard to believe this is the 5th year after I installed the new 8 hp motor....it will be interesting if it lasts longer than the average life of 8 years on the 7 hp design. PS The John Deere parts guys were amazed my 1974 Model 57 was still going !! Email me if you want the Autocad files I used in this project. I would post them here but this web server does not allow .dwg or .dxf file formats. 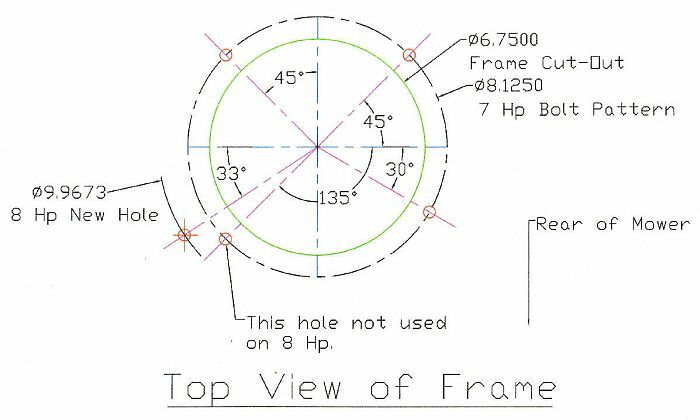 My neighbor's 2-dowel pin design. Side view of 8 horsepower engine with new throttle linkage. View showing plywood spacers under seat and new engine packaging. 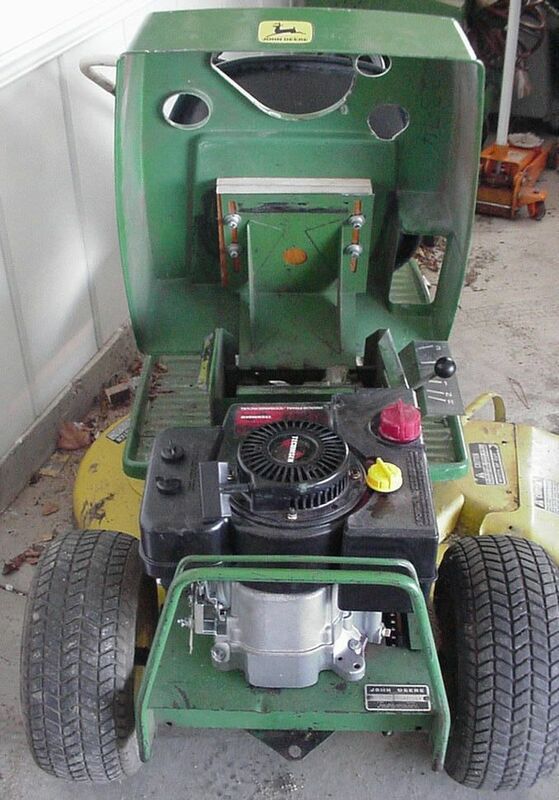 Side view of entire mower. This conversion took a lot longer than I originally estimated. A great deal of time was required to design the new pulley system and getting that rusty steering wheel off was a real bear ! I kept the length of the new 1 inch keyed shaft short because I was afraid it would be tough to center drill this piece...and make sure when I drilled from both ends they intersected fairly well. I used washers to make up the distance. The keyed shaft turned out to be much easier to drill than I thought ( I drilled it in steps using 5/16, 3/8, and final 1/2 inch bits). In retrospect, I could have simplified the design by eliminating this stack of washers and increasing the length of the new 1 inch keyed shaft. With regards to which pulley design is better, mine or my neighbor's, I think it is a toss-up. Assuming you already own or can borrow a good 1 inch drill bit, my neighbor's design is probably cheaper than my design. I say good drill bit because I borrowed my Dad's, but it was undersize and had so much run-out it would not have bored a good hole. My neighbor's design has worked well for 2 years and my is not field tested yet. [Jan 2009 update: My design has been field tested for 4 years now, and no problems at all] Choose whichever method suits you best. I still think the conversion was a worthwhile project. For less than $500 in parts, I hopefully have gained another 8 years of service from my favorite Model 57 mower. This beats the heck out of several thousand for a new John Deere rider!! Please email me if you have any further questions or suggestions by clicking on this link. I gave my old mower 2 shots of ether in the air filter, and it fired up the 2nd time I pulled the cord This will be it's 42nd mowing season!! I put in the new 8 hp mower in 2004, so this is 12 years on this motor. This has exceeded the 8 year average I used to get from the 7 hp motors, which is good news!! The mower started to throw the chain, particularly when going into reverse. I did not see anything obviously wrong, so I put the chain back on and kept mowing. This happened 3 or 4 times. On October 15, 2016, I heard a clunk sound, and the mower quit moving on a turn. I lifted the mower onto its rear end, and inspected it. I found the chain was off, and there was a small round gearbox on the main drive wheels that had come apart. The bad news was the mower was not movable, the back wheels were locked. I used an 8 foot 2x4 under the rear end of the mower, to raise it and move it 1 foot at a time. I got it to the sidewalk, then put the auto jack under the back end, and slowly pushed the mower around the sidewalk to the garage for repair. In the garage, I found the little round gearbox had 4 bolts to hold it together. 3 of the 4 bolts had broken, allowing the small planetary gear set to get out of its proper location. My guess is that the bolts loosened up after 42 years of service. As they loosened, eventually the round gearbox could open up, allowing the rear axle to move, and the chain to come off the big drive gear. 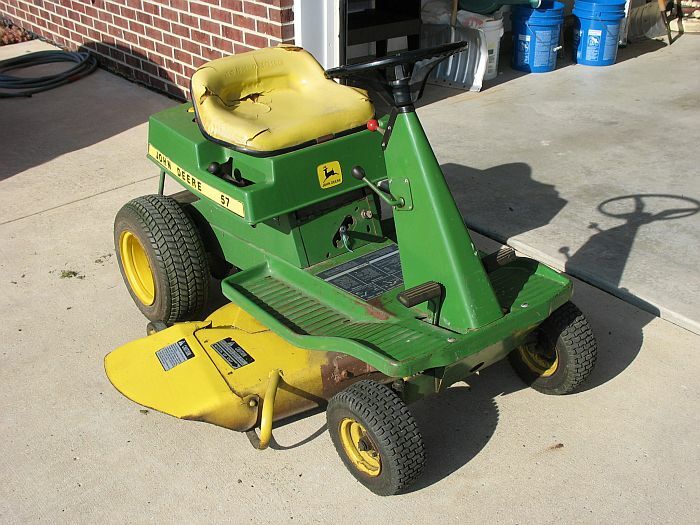 My hat is off to the guys who designed this mower back in 1974, because it is so easy to work on and repair!! I tried to mow up some piles of weeds in the yard, that I had pulled by hand, and of course they sort of get stuck in the front of the mower. Then I noticed the right front wheel was way outwards, almost ready to slide off. Apparently the jammed weeds had put outwards pressure on the front wheel, popping off the snap ring that holds the wheel onto the shaft. I got some 3/4" heavy duty snap rings from Fairbury Fastener, and some thin washers from ACE hardware, and repaired both the RH and LH front wheels. The drive chain has popped off a few times. Over 44 years of mowing, I'm guessing the big drive gear has worn down, allowing too much slop in the chain........and that is why it comes off the gear. The small tensioner gear has been at max travel for years. Upon inspection, I found the 4 bolts had loosened on the small rear axle. I tightened them up. I probably need to inspect them each mowing season and tighten. I decided to remove some links from the chain, so the tensioner gear was working properly and not at max travel. I used the Dremel with a fiber reinforced wheel to grind off the end of the pins, then used a nail and hammer to drive out the pin. Neither ACE or Fairbury Fastener had the right size master link to connect the chain back together. I ended up getting the right master link from the Pontiac John Deere dealer. It is model 41 type roller chain, and McMaster-Carr carries it also. Now the tensioner is at about 1/2 of max travel, so hopefully the chain won't fall off any more. The last repair involved the front RH mower deck support. 20 years ago it broke off, and my dad welded it. His weld lasted 20 years, but the adjacent metal wore through again. Since I can't weld, I decided to add some steel and bolt it back together. So now the mower is ready for another 44 years of mowing!! This 4th engine is on its 14th year, much longer than the 8 year average for the first 3 engines. I hope it continues to run ok for several more years.